This website was created to maintain the AFK legacy. : The 1st Annual AFK Munitions Supply reunion was held Nov 9-12, 2012 at the Hooters Hotel and Casino in Las Vegas, NV. : The 2nd Annual AFK Munitions Supply reunion in Dayton, Ohio was 12-15 September 2013.
: The 3rd Annual AFK Munitions Supply reunion was held over the 2014 Columbus Day weekend in Myrtle Beach, SC. 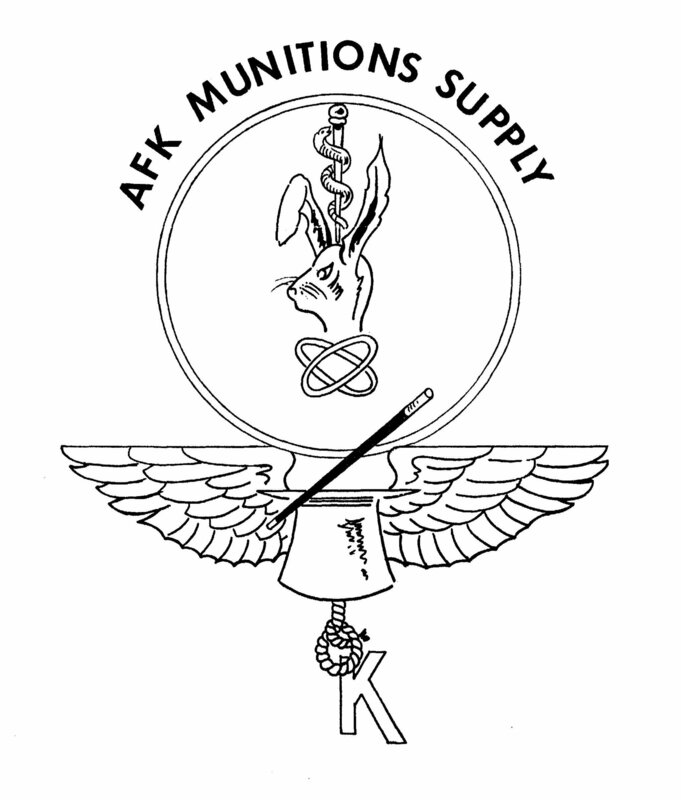 : The 1st bi-annual and 4th AFK Munitions Supply reunion is being planned and scheduled at the New York, New York Hotel and Casino. Dates are not firm, but looking around Veterans Day weekend 2016. Hope to see you there. This insignia should be displayed by U.S. Air Force Munitions Supply personnel so that they may be identified as an elite corps. The silver wings signify the association of the Munitions Supply Specialist with the Air Force. Unforecasted munition requirements come out of the magician's hat. Transfixed over the hat is the magician's wand, to signify the ease with which all supply problems are solved. On top of the hat is a crystal ball, used to ascertain future operations and maintenance munition requirements. The electron field denotes worldwide communications in finding and supplying requested munitions. The rabbit identifies the speed given in support of the wing mission. Above the rabbit, the python portrays the squeeze major commands put on Munition Supply procedures. The shaft, that the python is wrapped around, signifies what the munitions account gets in dealing with operations or maintenance. The pendant below is a hangman's noose implying misunderstanding between supply and maintenance. 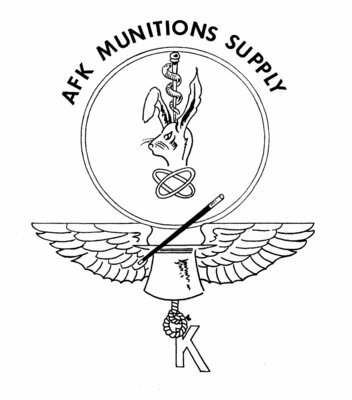 Hanging from the noose, the letter "K", signifies the management blunder in assigning this letter to the Munitions Stock Record Account and having a supply account work directly for a maintenance organization.